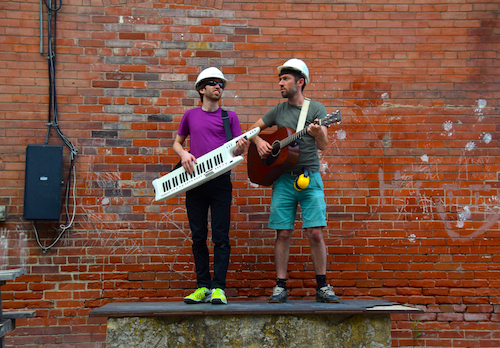 Marc and Xave are ex-engineer students who have found a way to mix music, comedy and nerdom into their show: Marc and Xave: Song Engineers by Xave Ruth at the Toronto Fringe Festival. These two best friends embrace nerd culture in a way you may have never seen before…through song. Let me start by saying these guys are endearing with a lovable form of awkward charisma only two ex-engineering students can have. Marc (Marc Tyndel) is the more introverted of the two, playing the keys behind a passion-filled frontman, Xave (Xave Ruth). They have great chemistry with a brotherly love connection you know took years to forge. Some bright spots in the show are: “I Don’t Party That Hard,” an ode to those less interested in partying and more interested in dancing with friends in a closed-in systematic loop, ie. a circle. The use of lighting and electronic sounds in this song were show stopping! Another stand out moment was the song featuring a strange wiki mind loop which put me into a comedic existential spin. I never knew math and science could go so deep. Another great moment is the Gregorian chant set to lyrics which are determined by the notes of a basic musical scale. Meaning there’s a lot of DAD, GABE, BABE etc. Marc and Xave craft a story based on this principle and the result is innovative and hilarious! The style of the music is comedic, a style made popular by artists like Weird Al Yankovic, Bo Burnham and Tim Minchin to name a few. Although the music itself has some catchy choruses that I was finding myself tapping along to, it seemed hard to catch a lot of the humour. The songs go rather quick. And although there is a lot of funny material, it seemed to be lost, sometimes because of a lyric flub or an awkward pause. The humour is pretty dark, which I am all for, I mean what nerd isn’t full of angst? But I feel like certain gags and jokes just didn’t deliver. All in all, I feel like Marc and Xave are the best friends we all want to be. Their nerd-thusiasm (if it’s not a word, it is now) is contagious, and their music, pretty darn catchy. However, the speedy lyrics and unsure delivery left me wanting more from these engineers. Photo of Marc Tyndel (left) and Xave Ruth (right) by Peter Rainmondo.